Are we seeing the decline of the Colts? • For Part One of Bill Simmons’ Week 2 NFL column, CLICK HERE. Super Bowl contenders blow out crummy teams at home. Especially crummy teams with quarterbacks that generate e-mails like this (from Jack in New York): “Did you see Trent Edwards during that final drive? I’ve never seen someone look that terrified of having to lead their team. He’s the perfect QB for the Bills. He crushes their hearts on the first game of the season so that their fans don’t get their hopes up for the rest of the season.” You could say he’s their Dr. Kevorkian. Which brings me to another rule: Anytime a team is laying 13 at home to a quarterback who can be successfully compared to Jack Kevorkian, you lay the 13. Hey, Calvin Johnson, why didn’t you take the blame for stupidly banging the football on the ground to lose what should have been a game-winning catch against the Bears? Every other good receiver knows to cradle the ball and roll over to protect it; you banged it off the ground like you were trying to smash a cell phone. It’s your fault the refs got involved in the first place. I tested out Jason’s idea with the Sports Gal. Her take on Johnson’s catch: “So what? He caught it. Did I miss something?” When I told her it was ruled incomplete, she made me rewind it, watched it again, then said, “That’s dumb, he caught it” and walked away. The point is, I shouldn’t have to call my wife over — someone who knows NOTHING about sports — to confirm the idiocy of a football ruling. But that doesn’t excuse Johnson from opening the door for that idiocy. Next time, man up and admit you blew it. A textbook undervalued/overvalued early-season play. I don’t think Brett Favre fully wants to be there. He’s carrying himself like William Petersen did during the last two “CSI” seasons. Fine, fine … I’ll come back. Just make sure I’m done filming by 5 every day. And only two takes per scene! I’m not kidding! And I get to direct two episodes! Not one, two! Dennis in Youngstown, Ohio, asks, “What did we do to deserve Jake Delhomme?” God hates Cleveland! I keep telling you. The Bears were my “Hmmmmmmmmm” team from Week 1. Cutler was flinging the ball and their defense looked lively. Now here’s where you say, “Yeah, but they were playing the Lions.” Exactly. That’s why I only said “hmmmmmmmmm.” Still, they’re undervalued and the Cowboys are woefully overvalued. You really want me laying seven and a half for a team that prompted Markley in Buffalo to send me this joke? “Q: What’s the difference between Tony Romo and Lindsay Lohan? 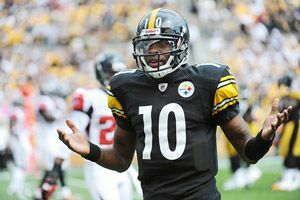 I mean … are we sure it’s a good idea for Dennis Dixon to wear Kordell Stewart’s old number? You’re telling me Steelers fans aren’t having Nam-like flashbacks every time he does something dumb? Congrats to Pete Carroll for getting his first Seahawks win last week despite being covered in USC’s blood. Congrats to the Heisman committee for giving Reggie Bush’s Heisman the Heisman. Congrats to Mike Williams for making a dramatic comeback and raising Matt Millen’s overall GM grade with the Lions from an F-quintuple-minus to an F-triple-minus. Congrats to Josh McDaniels for turning three No. 1 picks in 2009 and 2010 into a third-string tight end, backup QB and fourth-string receiver; I don’t even think David Kahn could have pulled that off. Congrats to the NFC West, because if the Seahawks cool off after a promising Week 1, we might see a 6-10 team win that division. And congrats to Seattle for taking home another WNBA title. This totally makes up for losing the 1979 NBA champs and Kevin Durant. And now, there’s no going back. Dave W. in Rapid City made me feel better about Tom Brady’s hair: “My theory is that Gisele has been watching ‘True Blood,’ loves vampire Bill and wants her husband to look just like him.” I like it! Vampires are in right now. Unrelated: Wes Welker’s dramatic comeback from an ACL tear, followed by two touchdown catches in Week 1, got me more choked up than the “It’s real to me dammit” guy. I love that guy. I thought about buying a Rob Gronkowski jersey because I’m a sucker for tight ends and he’s potentially the best Pats tight end since Ben Coates — they even gave him No. 87 — but I couldn’t cheat on the Welker jersey. Not after that comeback. So I settled on making the Gronk my Twitter avatar. By the way, I turn 41 in a week.